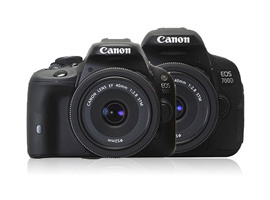 Canon EOS 700D (Rebel T5i) & EOS 100D (Rebel SL1) preview: Has Canon saved the entry-level Digital SLR game? The new Canon EOS 700D (Rebel T5i) replaces the existing EOS 650D (Rebel T4i) and features a very similar specification including a 18-megapixel APS-C (22.3 x 14.9mm) Hybrid CMOS sensor and Canon’s DIGIC 5 image processing engine. In fact not much has changed on the new model, which continues to feature a 9-point autofocus system, 1.04m dot 3-inch vari-angle touch screen LCD, 5fps burst shooting and a ISO 100 – 12,800 (expandable to 25,600) sensitivity range. Updates therefore are limited to the addition of a 360 degree rotating dial mode and a new external coating for a more durable finish. The big news however is the launch of the Canon EOS 100D (Rebel SL1) unveiled as the smallest and lightest DSLR in its class. The popularity of mirrorless hybrid cameras has been huge but with the mirror removed hybrids only allow composition via the LCD or an EVF, a change that many traditionalists have resisted. The EOS 100D (Rebel SL1) solves that problem with a standard reflex mirror built into its diminutive 116.8 x 90.7 x 69.4mm shell that weighs only 407g. Compare that to competitors such as the Nikon D3200’s 125 x 96 x 76.5 mm 505g unit, or the Sony SLT-A37’s 124.4 x 92 x 84.7mm 506g body, and the 100D is both smaller and around 100g lighter. What’s more with a range of simple controls and built in user guides on the EOS 100D (Rebel SL1) Canon also look like they want to attract new consumers to revitalize the entry-level DSLR market. In terms of specification the EOS 100D is very similar to the EOS 700D featuring the same 18-megapixel APS-C Hybrid CMOS sensor and DIGIC 5 processing engine, ISO 100-25600 (expandable) sensitivity range, full HD video capture and that 3-inch LCD touch screen. Both DSLRs feature user-friendly Intelligent Scene Modes for simple shooting, Creative Filters for adding processing effects in-camera and of course are compatible with the full range of available Canon EOS lenses and accessories. The update version of the Canon’s EF-S 18-55mm f/3.5 – 5.6 IS STM ‘kit’ lens is included with the standard bundle for both DSLRs, and as well as a 4-stop Image Stabilizer includes a Stepper Motor for the smooth and near silent autofocus required for video capture. Both DSLRs are available for pre-order now with body only prices of $649 for the EOS 100D (Rebel SL1) or $749 for the EOS 700D (Rebel T5i) and we look forward to publishing Sensor Scores soon.